Just in case we haven't already made it perfectly clear, we love station wagons here at the Jalop. We also love AMCs, so it made my day when I spotted this sharp '69 Ambassador wagon parked in Alameda's South Shore neighborhood. First off, it's got the 343 engine. You don't see many 343s; AMC made them for just a few years. Of course, if I owned this car it would have a 401 under the hood (but I'd keep the 343 emblems). The '69 Ambassador SST wagon went for $3998, a fairly steep price when you consider that the '69 Ford Country Squire went for $3644 and the Chevy Kingswood Estate carried a $3678 price tag. But when you went with the AMC, you got a bunch of cool little details. Check out this beautiful side mirror! Or the fancy tiedowns by the roof rack! The big Wisconsin wagon definitely had more style than your typical late-60s Detroit wagon. Weird Rambler-y style, sure, but that counts too. A little hint of fin for the tailight lets the world know you haven't sold out just because you're driving a family hauler; this must have been the wagon to bring to swingin' suburban key parties. That distinctive Kenosha grille might as well have big neon letters spelling out A-M-C. 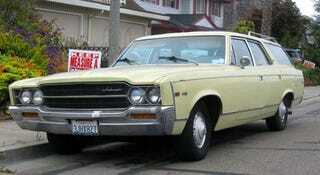 The SST was the top trim level for the Ambassador in '69. For $168 extra, you could get the 315-horse 390 engine; unfortunately, the 4-speed wasn't an available factory option in the Ambassador that year (but an agreeable AMC dealership may have been able to find a way to get one for you). Other than the taped-up taillight lens, this wagon is in great original condition.